Career Options, Inc. is dedicated to providing the highest quality services at the most competitive prices possible. Career Options, Inc. can assist you with finding qualified candidates to fill your current employment needs, both direct hire and temporary. This option consists of Career options advertising the position, screening candidates that fit the needs of your business, which includes face to face interviews, and then presenting you with candidates for a final hiring process. All employees are drug screened prior to assignment as well as full background checks. Once you have chosen your candidate, the candidate can either be hired by Career Options for an initial 90 day period, or you can choose to direct hire for our standard fee. If you choose the 90-day options, these employees would then be eligible to become employees of your company when that period has expired at no extra cost to you. Utilizing state of the art screening, testing and training methods to provide the most experienced and qualified temporaries to our client companies. Emphasizing for all candidates to have prior work experiences ensure client satisfaction. A Career options, Inc. temporary - proven and accepted in accordance with values, principles and visions set by your company is working for you now and ready to accept the challenges of a permanent career. 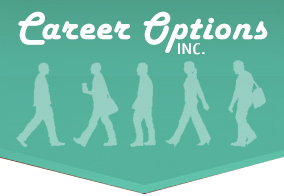 Client companies have the option to hire a Career Options, inc. temporary at any time. If an employer wants to hire a Career Options, Inc. employee before the 90 day probationary period is over there will be a conversion fee. Career Options, Inc. charges a percentage of annual salary. Guarantee: Career Options, Inc. offers a 90 day guarantee on every direct hire placement made to client companies. If the candidate leaves the client company for any reason within the first 90 days, Career Options, Inc. will provide qualified candidates from which you may hire a replacement at no additional charge. The guarantee is applicable only if payment of the entire placement fee has been made upon receiving the invoice. Group health insurance package. This package includes any or all of the following: health insurance, dental, life, and many options. Career Options, Inc. has the ability to offer employees paid holidays, paid sick or personal time. After one year, full time employees are granted one week of paid vacation time. For the ultimate worry free employee environment: the contracted employee. This option starts with employees that are screened and hired by Career Options, Inc. These employees would then become employees of Career Options, Inc. under a contract arrangement with your company. The employees would be under your supervision and direction, but would remain Career Options, Inc. employees. Your company would no longer be responsible for the wages, workers compensation insurance, unemployment insurance, and liability for these employees. Career Options, Inc. takes over all the risk and paperwork. So Apply Today and start taking advantage of job placement from Career Options, Inc. in Carroll, Iowa. Fill out an application here and check out the current job openings here.